The center of its business : Top-of-the-range men's shirts, with an asset of more than 200 body and 300 collar shapes. Dounitex makes a point of honour of regularly improving quality of all articles manufactured for its partners such as blouses, men's underpants, pyjamas and image wear. 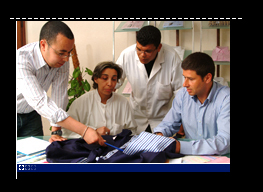 To guarantee excellency, inputs Dounitex uses for manufacturing its products are 100% of European origin : fabrics mostly from Italy and presentation accessories from Germany. Referenced and appreciated by top British brands from Jermyn Street, Dounitex masters and offers several manufacturing techniques such as use of non-fused interlinings, French seams, slim fits, but it also manages other related activities such as embroidery, screen printing, washing, fading and dyeing.